Insights for succcessful leaders to become more successful! How attitude is a good predictor of prospective employee success, and how you can identify those with the right attitude for your business. The top challenge for CEOs according to a survey from the Conference Board (January 2013) is Human Capital – the ability to develop and acquire the right people, with the right skills needed to take to the business to the next level. But skills alone are not enough. This is an old mantra which, if ignored, can be costly. Companies I have worked with have found that recruiting people with the right skills can be costly if they do not have the right ‘attitude’, where there is a lack of ‘fit’. This is reflected in a study by Leadership IQ of over 20,000 new hires over 3 years which found that 46% of the people about to be hired will fail within the first 18 months on the job. And they won’t fail for lack of skills but rather for lack of attitude. 1. Coachability (26%): the lack of ability to accept and implement feedback from bosses, colleagues, customers and others. 2. Emotional Intelligence (23%): the lack of ability to understand and manage one’s own emotions, and accurately assess others’ emotions. 3. Motivation (17%): insufficient drive to achieve one’s full potential and excel in the job. 4. Temperament (15%): attitude and personality not suited to the particular job and work environment. 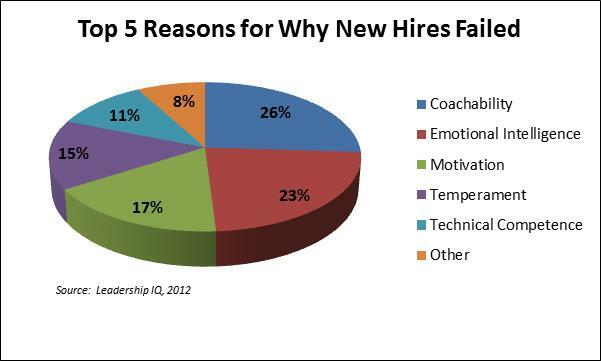 The key point from this is that when new hires fail, and 46% of them will, 89% of the time it’s because of attitude and only 11% of the time because of skill. 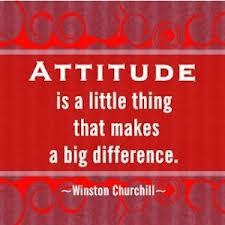 Define the Specific Attitudes – what are the attitudes that make your business different from the rest. This is both in terms of what is good (which you want) and what is bad (which you want to avoid). Adapting the Hiring & Interviewing Process – you need to makes sure that you focus on these attitudes, so adapt how you do this as appropriate. Attitudes in themselves are not visible or tangible. Where they are made apparent is in people’s behaviours. How people behave is an active display of their attitudes. Their behavior should also be a reflection of the business’ core values which provides guidance to people in the business. A good example of how the core values are made tangible, and the expected behavior (and hence attitudes) is shown below. Honor – integrity, responsibility and accountability. Courage – do the right thing, in the right way, for the right reasons. 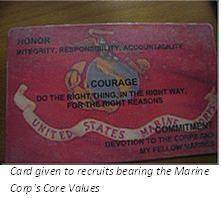 Commitment – devotion to the Corps and my fellow Marines. Too often, when interviewing, we focus on prospective employees’ technical skills and competencies. Why? They are the easiest to assess but, as we have seen, they are a very poor predictor of the success or failure of a new employee. When you look at jobs being advertised the experience, skills and qualification that are detailed it can be seen that the business advertising the position has the expectation that a perfect candidate will apply. This is about as far from reality as you can get. Realistically, there is no ‘perfect candidate’ and, as such, there can only be attitudes that are right for your business – they will never be perfect. They always see problems as opportunities. They are great listeners and communicators. They avoid responsibility and are quick to blame. They focus on themselves rather than others. They do the bare minimum work required. How does this attitude add value or competitive advantage to this organization? (If the attitude brings no benefit to the organization, it doesn’t belong on the list). Doing this provides insight into both what you want and what you don’t want in the terms of attitudes and the associated behaviours. It then helps you to prepare for the interview by focusing on how they respond to questions around both these areas. However, how the questions are phrased is just as important as what the question is. You need to develop the question with the kind of response that you are looking for in mind. But that is a separate article. In summary, be clear on what values, attitudes and behaviours you want in your business, and which you want your new employees to exemplify in what they do and how they do it. Get clarity by distinguishing the attitudinal characteristics of both your top and low performers – this helps you to identify what you want from a potential employee, and what you don’t want. Around this then adapt your interview and hiring process to ask the kind of questions that will help you elicit answers which will help you determine the prospective employee’s values, attitudes and behaviours. Take this into account when you look at their technical skills, as it is their attitude that is a predictor of their skills – not their technical skills and competencies. Click here to find out more about Andrew Cooke and Growth & Profit Solutions. So which is more important, management or leadership? This is not the right question to ask, rather the question to ask what is the balance between management and leadership that you need to have? To answer this, you need to at what role each plays. Management ensures the stability and efficiency necessary to run today’s business reliably. Leadership creates the change needed to take advantage of new opportunities, to avoid serious threats, and to create and execute new strategies. The point is that management and leadership are very different, and when organizations are of any size and exist in environments which are volatile, both are essential to helping them win. Doomed – weak management, weak leadership. Here the business is run inefficiently and with no clear direction to guide and align people’s efforts, decisions and the allocation of resources. People are not inspired or motivated to achieve high-performance, and the business is losing to its competitors. The business is unlikely to survive beyond the short-term. Innovative – weak management, strong leadership. Here the business is able to adapt quickly and effectively, but there is insufficient management and associated skills in place to drive stability, efficiency and to create the necessary order to manage the resulting complexity and create order from which to build. Well run but bureaucratic – strong management, weak leadership. Here the business is well-structured and managed; it works efficiently which is good while the status quo exists. However, in an environment of change it finds itself relatively rigid and inflexible with its existing bureaucracy and organization being unable to adapt effectively. This can expose the business with existing strengths potentially becoming major liabilities, potential competitors going unrecognized or changes in customer needs going unmet. Well run and innovative – strong management, strong leadership. Here there is a healthy balance of management and leadership skills and capacity. The business has a clear direction around which everyone and all actions are aligned, people are inspired and motivated, and as a result they work both efficiently and effectively. They are competitive, adaptive and have the right mix of skills, capacity enabled by a strong business culture which supports the people in their work. Look at this matrix and, for you and your team, assess their level of management and their level of leadership. People do not need to be a manager or a leader per se, nor is it about their position in their hierarchy. Rather it is how good they are at delivering on and exemplifying the attributes got management and leadership (see the table below for ideas). Score yourself and each of your team members on leadership and management using the following scoring range of 0 (very weak) to 10 (very strong). The two scorings will give you each individual’s relative positioning and your own. A good idea is to assess people yourself, then get them to self-assess, and then to share your respective findings and discuss the differences/similarities. This is a good tool to identify where and how an individual needs to develop their management and/or leadership skills. This can then be used in helping put together their personal development plan. If you found this article of use or interest please don’t hesitate to share it with others. Be transparent and simply tell the story. Don’t assume everybody already knows how the turbulence is affecting your business. They need to hear exactly what is happening and the need to hear is often. Be clear about the reality and don’t fall into the trap of sounding more optimistic than you should. Talk about what’s next. If you have a strategy, spell it out in clear terms. If you don’t, say so and ask for help. Describe what has to happen and what everyone’s role must be. Give people the chance to share their feelings, concerns and, most of all, their ideas. Clarity reduces fear, even if what is made clear isn’t very positive. So as leaders we must talk straight and listen with empathy to the concerns of our teams. Use these steps for yourself and your team, and help them to cascade it to their people in turn. To view or download a PDF version of this blog click here. Disciplining people has always been a difficult matter for managers with many being uncomfortable with its adversarial nature. This often leads to the performance or behavioral issue being avoided and left unaddressed (which exacerbates the problem), being addressed inconsistently (which makes the manager seem week and the process unjust), or being handled poorly (which damages the relationship and creates an on-going problem). Rarely is the discipline process handled well! The traditional progressive discipline approach is certainly unpleasant. It breeds resentment and hostility. But the traditional system is flawed in two ways: firstly, it tends to exclusively rely on punishment, and secondly it is insufficiently demanding on the person being disciplined. Punishments used, such as warnings, reprimands, suspensions without pay, only produce compliance which only works in the short-term and is ineffective. You want commitment, and you cannot punish people to gain commitment. So how can you discipline people effectively without resorting punishment? And how, in doing so, can you gain commitment from the employee to perform and behave to those standards which are expected? Before we go into this there is one caveat, we are assuming that you have and follow a documented disciplinary process. If not, you need to develop this as soon as possible, so that the process is clear and transparent to everyone (managers and employees), and that you are consistent in your treatment of people. This new approach is progressive, as problems became more serious so the responses became more serious. But instead of using punishments, the focus is on engaging the individual in agreeing to change. They are being treated as an adult, not as a poorly behaving child. The focus is on requiring the individual to take responsibility for themselves and their actions and to make the decisions for himself or herself. Often the final step in a traditional disciplinary process, before termination, is an unpaid disciplinary layoff. In this approach, this is replaced with a paid disciplinary suspension. Upon reaching the final step in this new system, the employee is told that he would be suspended from work on the following day. He was told that he must return on the day after the suspension having made a final decision: either to solve the immediate problem and make a total commitment to fully acceptable performance in every area of his job, or to quit and find more satisfying work someplace else. The company bears the cost of this paid day as a sincere demonstration of its desire to see the employee change and stay. However, the employee is told that if he decides to stay, and there is another disciplinary problem, then he or she will be terminated. In essence, his or her future is in his or her own hands, it is their choice to make, and the company will accept his or her decision. Fundamentally, the choice is either to change and stay; or quit and find opportunities elsewhere. Provides a dramatic gesture – the suspension period forces the employee to face the facts; face unemployment or correct your behavior. Defensive – should an employee be fired and then challenge the action the company has a clear and demonstrable process that the employee was fully aware of the situation and the alternatives, and that the employee made their choice. Demonstrates good faith – this shows the individual that the business is serious in its intent. It makes life easier for managers – many managers are loathed to take disciplinary action. This process makes it easier as the onus for the decision to stay or leave is the employee, not the manager. It’s appropriate for any job – whether the employee is at the front-line, middle-management or in the upper echelons of the business it is equally applicable and transparent. It reinforces your values – most organizations take pride in being fair employers. This allows you to be so without punishing people in a way that compromises the spirit of your values. So will you keep discipline without punishment? Make people responsible and accountable for their performance and actions, and help them decide what to do – whether to leave or to commit to change and improve their performance and how they behave. In times of challenges and uncertainty, supervisors might be experiencing an increase in the number of difficult conversations with their staff. These could include delivering bad news about an employee’s job, informing staff about work restructuring, or discussing other complicated and stressful work situations. Before going into the conversation, ask yourself several key questions. Consult with peers, and other appropriate resources to be sure you’re comfortable with the answers. What is my purpose for having the conversation? What do I hope to accomplish? What is the ideal outcome? What assumptions am I making about the other person’s reaction to the conversation? What “hot buttons” exist – for me and for the other person? How is my attitude toward the conversation contributing to the intended outcome? Practice the conversation. You can mentally rehearse it in your mind, or practice it out loud with your supervisor, Employee Assistance Program, or Human Resources. A successful outcome will depend on two things: what you say and how you say it. How you approach the conversation and how you behave will greatly influence what you say and how it is perceived. Acknowledge any emotional energy that might be fueled by the conversation. The emotional content is as important as the facts. Keep aligned with the purpose of your conversation. Don’t be distracted by side tracks. Approach the conversation with an attitude of inquiry and discovery. Set aside assumptions and try to learn as much as possible about the other person’s point of view. Let the employees complete what they have to say without interruption. Acknowledge that you’ve heard what the other person is trying to say. The best way to do this is to repeat their argument back to them. You don’t have to agree. Saying “it sounds like this issue is very important to you” doesn’t mean that you have to decide the way they’d like you to. Advocate for your position without diminishing theirs. State your position concisely and clarify points they may not have understood. End with problem solving. Find mutual areas where you can agree on solutions and identify what steps need to be taken. If there is no common ground, return to inquiry. We often look at the risks associated when people don’t conform, and we often don’t like those who fail to act in the way we want or we expect. But how often do we consider the risks associated with conformity? The answer is rarely, yet the risks are considerable. We often go along with a course of action, or carry on with an activity even when it is obvious to us (and often to others) that to do so is detrimental. Think of the time you pushed yourself too hard in the gym, or in a game or a race, and you paid for it later. Why do we do this? Well, it is not so much about being brave but about being part of the group. A kind of keeping-up with the Jones; if you will. Research shows that we tend to conform to the behaviors of those around us. For example, if your work colleagues take sick days, then you’ll start taking them too. This may not seem important – but let’s look further. The recent problems at Volkswagen who were found to have manipulated emissions tests for at least seven years illustrate this. Suggestions have been made it was only a couple of people were responsible, but in an organization of over half-a-million people worldwide this does not seem credible. In this time nobody said anything. Why? Because nobody else had said anything no-one else did. If you are a leader you need to act and do what is right – and this may be not conforming and going against the rest of the herd. The question is this: what will you do, and what are you doing now that others are conforming with? Remember, people will follow what you do not what you say! To do this, firstly, be clear on what your values are, those which are non-negotiable; secondly, be clear as to what is happening around you and also because of how you act; thirdly, make sure that you act in a way that is aligned with your values. If this means taking a stand, then do so – to act with integrity requires courage. Leading from the front is never easy, but that is what every good leader will do. So what are you going to do? You can also find further insights and a wealth of material on business and leadership on Andrew’s other blog – Growth & Profit Solution Blog. There are also a large number of resources at his Blue Sky GPS Website, and these can be found Blue Sky GPS Resources. In a podcast of a lecture by Tim Macartney which he gave at the London School of Economics that I recently listened to – and which I would highly recommend – he shared a valuable insight which hit home for me. I would like to share that with you here. The story goes that Tim, and a number of business leaders in South Africa, met with Mac Maharaj. Mac Maharaj was the leader of the ANC’s ground forces in the bush war against the apartheid regime, a brutal and bloody time. He played a key role in the negotiation process to South Africa’s first democratic elections, and later became the Presidential Spokesperson. A simple, unequivocal and unexpected answer. But one which had a lot of thought and significant implications. He explained: “I am sick of leaders who have no questions, who think they know and are convinced that they right, the constant emphasis on confidence, on having no doubt. I know I had a deputy who had no self-doubt and who probably killed more of our own people than the enemy”. He went on to describe how he would prefer a person who has sleepless nights questioning what they had done, the orders they had given. That is a person who cares – they care about the decision and its impact, not as a way of looking good or for self-advancement. So how does self-doubt make you a better leader? It will only work if your self-doubt is genuine and not contrived. Self-doubt makes you humble, it gives you humility. It makes you think long and hard about what you decide to do. You know that you don’t know all there is to know, and that you need to continually learn and grow through other people so that they can grow and so that you can make better decisions. To learn and grow you need to listen more and talk less, avoid becoming opinionated and “fixed” in your attitude, perspective and mindset. To lead well you need to feel and to sense more. You need to be more open and remove your ego. As a leader you understand that your power comes from who you are, not what you are. You need to be consistent to who you are and what you represent, because people witness the quality of the human being that is the leader. It is that essence of the leader – the you – that people follow, and it is the people who the leader serves. Don’t confuse self-doubt with a low self-esteem, it quite the opposite. To have good self-esteem you need to be self-aware – you need to be aware of your own strengths and weaknesses, how you affect others and how you are affected by others in turn. So welcome self-doubt and let it thrive. Use it as a tool by which you can grow and develop, and by which you can become a better leader. What are you going to do to harness your self-doubt and help other to harness theirs so that they can become better leaders too? Which Would You Rather Be – Efficient or Effective? Answer At Your Own Risk!